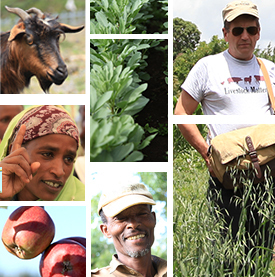 Compared with other Ethiopian Highland early win projects, the ‘Research for Development‘ project focused on the research process so as to propose a flexible and generic approach to implement demand-driven research for development (R4D), while promoting partner-led processes and dissemination. In a recent workshop, some 20 participants analyzed the results of this early win project. Sharing of experiences among involved stakeholders, to evaluate innovations, draw lessons and share experiences with other stakeholders and regions by means of e.g. stakeholder discussions, farmer field days etc. Impact assessment using a household survey, type identification, farmer selection, panel surveys and final comparative assessment. Such an approach aims to find a balance between research-led and farmer-led innovations and relies strongly on a solid typology of farmers that itself is co-created to avoid over-dominance of either researcher or farmer biases and preferences. The project team had limited time to carry out the field work, so only the first step was carried out. In the workshop, participants questioned the approach and discussed at length the method to develop the typology. Who should be involved in the typology work and how? How to ensure that the participatory processes are facilitated adequately? How can this work be scaled up and out? For whose benefit? How can national and international organisations build synergies to promote partner-led processes? Despite these challenges and methodological questions, the project leader pulled together insights into a final presentation for further discussion at the ‘Ethiopia planning meeting‘ the following week. The Africa RISING program comprises three linked research-for-development projects, funded by the USAID Feed the Future Initiative, and aiming to sustainably intensify mixed farming systems in West Africa (Southern Mali and Northern Ghana), the Ethiopian Highlands and East and Southern Africa (Tanzania, Zambia and Malawi). To produce some short-term outputs and to support the longer term objectives of the projects, in 2012 Africa RISING funded several small, short-term projects in each of the regions. More information. Tags: early win, participation. Bookmark the permalink.